I’ve been thinking a lot today about genes and genetics. I have this weird love/hate appreciation/annoyance at all things genetic. I find the principals of genetics and their impact to be fascinating and yet I find the study of them and the science of them incredibly boring. When Chef Husband was the TA of a genetics course years back I would pray that he wouldn’t want to talk about the course (thankfully, he’s much more interested in his field of study – ecology – than he is about genetics and didn’t much like talking about it nor teaching it). That doesn’t even start to delve into any other relatives like aunts and uncles for me or my husband. History of food allergies? why yes, I think there just might be one there. She has her dad’s tonsils and her mom’s ears. 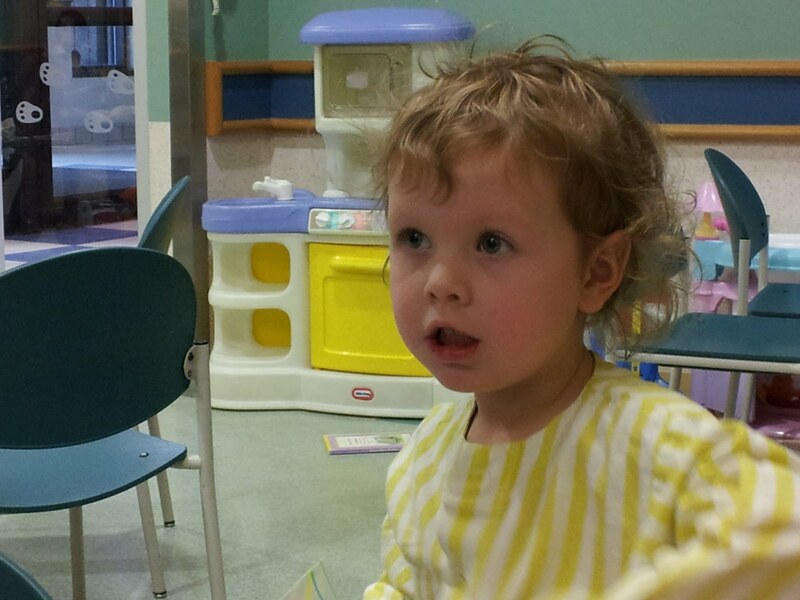 Her tonsils (and adenoids) were covering 75% of her throat (and nose). Just like her dad’s do. Her ears just won’t work properly on their own, so she’s on her second set of tubes now to eliminate ear infections and to restore her hearing (more importantly). She had moderate-severe hearing loss in one ear and mild-moderate in the other. Just like I did. It’s all in the genes. Looking beyond the physical and medical side though, watching your children develop into this insanely strong, self-advocating, educating, powerful young beings makes me proud to know that they have my genes in them. If I gave them even a portion of their strength and intellect, then I applaud my genetic make-up. Because man alive, I am proud to be the mama to these children. Their children may have much higher likelihoods of food problems (just look at the genetic history! ), but if the strength of my children is any indication, their kids will get by just fine. 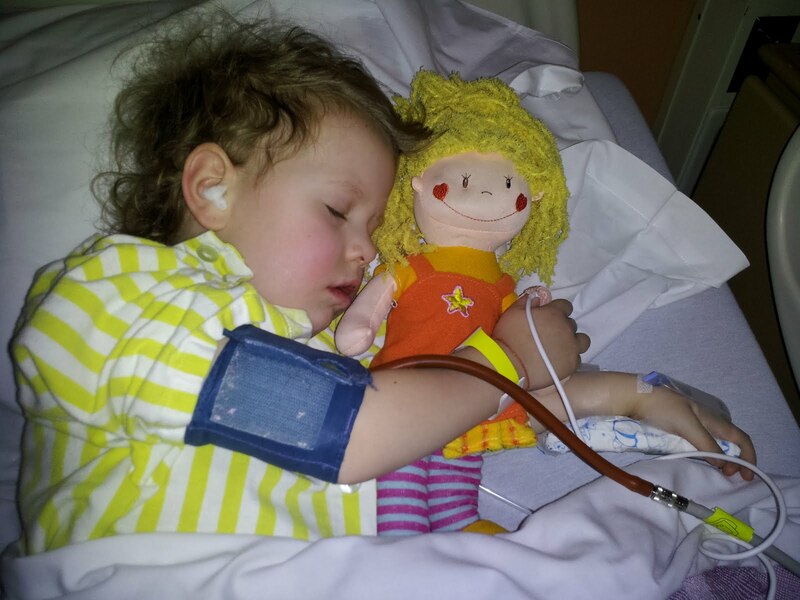 Here is my daughter post-op, cuddled up to her doll she named “Lemon”. She’s doing well, eating like a machine, drinking up a storm, and talking. (Look for another post this week on what to do when you’re away from home as a celiac). I can’t explain how important it is to have support around you when you have food allergies, intolerances, or celiac disease. The people around you can make transitioning so much easier, and when people really “get it” there is an immense feeling of relief that you aren’t alone. Celiac number one got diagnosed and had a bit of a meltdown about it. Her husband gave her immense support and took cooking to a whole new level. He helped her relabel their kitchen, replace things that needed to be replaced, reorganize their cupboards, and learn how to bake all kinds of breads, goodies and food that was all gluten free. He looks out for her as much as anyone else could. Celiac number two got diagnosed. Her husband wouldn’t let her buy any replacements for the kitchen because it was too expensive, and did the same for food. Celiac number two had no idea how to go about starting, and with no support, but rather push-back from home, she continues to consume gluten and is just as sick as ever. Celiac number one is me. Celiac number two is someone I really do know. I help people. Newly diagnosed celiacs call me or email me to ask for advice. Parents of children who are new to the allergy world find me on facebook through their friends and send a message to me asking what to do, where to start and how to deal with this new restriction. I love this ability to help people. I always tell people that if they want to pass on my name they can. It can be so overwhelming and so daunting when you first get diagnosed with any food restriction. Having someone who has been there – mentally and physically – can be very comforting and reassuring. Support can come in many forms and I consider myself lucky to be surrounding by amazingly supportive friends and family members. They go out of their way to find food my family can eat (even buying desserts for my daughter so she doesn’t feel left out of special dessert time at dinners), offer me support when I get glutened, and wait for the updates after appointments with the allergist for my son. I’m very, very lucky. If you, or someone you know, needs that support, send them my way. Point them to my blog, find me on twitter @mamaceliac, or contact me for them. Let me offer them support and start them on this amazing journey. I find the science of allergies and celiac to be fascinating and I truly love helping people find hope during that initial overwhelming period. As an aside – please send as many good thoughts as possible to my family. Miss A is having her rescheduled surgery tomorrow! I’ve had a rough week. The funny thing about that is, a few years ago, said rough week would have thrown me into a tailspin. Anxiety would have gurgled up and spat me out into a person who couldn’t get anything accomplished. Now, I have changed. I have become a person that I love. I respect myself, appreciate myself, and take little for granted. I don’t hold grudges (well, not to the same degree I used to anyway), I see no point in vengeance, I try to look at the positive despite that being really hard sometimes, and I know that I alone can have an impact on how I handle a situation. So after my rough week, I decided to cook my troubles away. For the last number of years, Chef Husband has been in charge of the kitchen. I’m a pretty good cook, but he has always gotten quite a bit more pleasure out of cooking, and he definitely likes food more than me. In the last month, I’ve been finding my way around the kitchen more, and having quite a few successes (and I’m not going to lie.. there have been a few disasters). i feel rejuvinated, and I realize that as much as Chef H loves to cook and is a bit of a control freak in the kitchen, he appreciates my help and likes not cooking every meal. I may have to make some significant dietary changes again. My biopsy results came back with weird results – nothing serious, but it’s a toss up at this point as to whether it’s Acid Reflux or the more daunting unknown Eosinophilic Esophagitis. I get rebiopsied in 3 weeks and should have a definitive answer one way or another then. But back to cooking the troubles away.. a long time ago, we had this amazing chili like concoction that was lovingly known as “Bean Stuff”. I have no idea why I had a desire to eat this comfort food, but I did. So I made this beautiful nutritious (mostly) supper for the family. And voila, a beautiful meal (with plenty of leftovers). 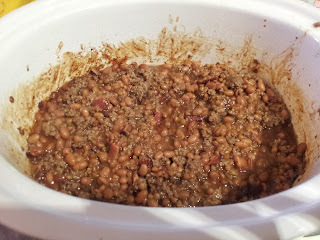 I love the additon of lentils into this dish for nutritional value, and taste. It’s sweet without being too sweet and has a great flavour. We served it with a bun recipe from Jules Shepard’s Free For All Cooking – one of my favourite cookbooks ever. a variety of additions (think mushrooms, peppers, bacon, sausage, onion, cheese, etc). Put the additions on the bottom of the muffin pan, add the egg mixture almost to the top, and cook for 20 minutes at 350. So easy, gluten free, dairy free, nut free, soy free, delicious guaranteed! 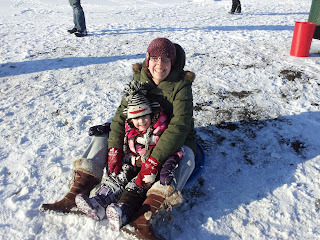 To celebrate the fact also that it warmed up 40 degrees (from -40 to +1 in a week), we went sledding together – an amazing fun outdoor activity that resulted in some very happy children! If you have a child with food allergies or restrictions of any kind, birthday parties can be a source of difficulty. Not only are you faced with having to discuss, usually at length, your child’s food issues, but I personally always get this slightly panicked feeling as I send them off. It didn’t used to be so bad. Before, I would always accompany my kids. I still do stay with my daughter as she’s only 4, but my little man, he’s almost 6.. and he goes by himself now. His latest party was on Sunday and not only was I not going, but I couldn’t drop him off or pick him up because I had a meeting. Mini freak out? Why yes, yes I did. I thought it might be helpful to have a list of questions to ask, or things to remember to discuss as you start to send your child on his own, as well as things to talk to your child about. You see, believe that the more you share with your children about their limitations, the more they will become an advocate and become a stronger little human. These are also questions you yourself can use to ask potential dinner hosts or restaurants! * Make sure you review the “If in doubt, spit it out” rule. Vital rule for the rest of their life. * Review and rehearse exactly what they allergic to, and make sure they can say it in a full, clear sentence. “I am allergic to peanuts and nuts and I can’t have any at all.” – simple words are all that is needed. * Review the “what-if” scenarios – what if you feel like your throat is making it hard to breathe? Where is your epipen located? * Make sure your child has a medical alert bracelet. This could save their life. * Be clear that there your child has food allergies / celiac disease and that you need to make sure that the food at the party will be safe for your child. * I always ask whether that parent is comfortable with my child’s allergies. As much as I don’t want my kid to miss a party, I’d rather he come home alive. It’s usually a long conversation. But so far I have felt really comfortable in each situation letting Little Man go to parties. He’s gone to 2 this school year in people’s homes I’ve never met. Both times the parents were wonderful. My husband also told me that Little Man went around telling everyone to put away any nuts because he’s very allergic. Now *THAT* is what I call an advocate! Don’t be ashamed of your food restrictions. The more you educate people, the more they will know for next time. You are responsible for your health, and for the health of your child. Be strong – the first conversation might feel awkward and hard, but it gets easier each time. As celiacs, or people with allergies, finding products that are allergy-free can be a daunting task. I’ve had a few people ask me lately where I find my products. You see, even though I’m not well known in the blog or allergy world, I am a go-to person for a lot of people in Edmonton who are starting to go gluten-free. We are also a family that has 2 soy-free people, 2 almost completely dairy-free people, and one 100% nut-free little man. I am extremely allergic to shellfish too. My mom is allergic to bananas and grapefruit; my brother to bananas, all nuts, fish and shellfish. But while foods are getting more labelling laws around them, what about the rest of your body? As a celiac, would you put lipstick on that wasn’t gluten-free? Does a day really go by that you don’t lick your lips? And if what you put on your skin is absorbed into your body, should you make sure that what you’re using is free from your allergens? When I first when gluten-free in 2008, I didn’t think very much about anything other than food. In the last year or so, I’ve noticed that my eczema flares up if I’m not careful about what I use on my skin, my head itches like crazy if I use generic shampoos, and my skin feels like it’s on fire if I use random lotions. So, here are few companies/products that I go-to a lot, for both me, and my children. The Canadian company Green Beaver has some really great options out there. I especially love their Conditioning Detangler – it’s gluten free, nut free and vegan and smells delicious! It also works wonderfully on my wee girl’s frizzy locks. They have gluten free stuff for adults too. Another one of my favourites is LUSH. Almost all of their products are gluten-free. A couple of them contain oats, though apparently in testing they are coming up as gluten-free. I don’t use any of their products with oats in them, but I absolutely love their shampoo bars, their veganese conditioner, and the snake oil for itchy scalps. I have the majority of my facial stuff from here too. So now you have some skin care and hair options. But what about make-up? I love the All Natural Face. I’ve had the pleasure of emailing back and forth with the owner about the ingredients and feel very comfortable in her knowledge of what goes in her make-up. I almost exclusively use the eyeshadow from here, and often use the foundation powder and blush as well. On top of that, the prices are unreal for the quality of product you are getting. I am on the hunt for a good gluten-free mascara. I’ve been asking everyone, but have yet to find one that I like. If you have any ideas, please let me know!! And finally, AVON actually has the majority of their lipsticks/glosses/balms gluten-free. You just have to ask, and they will let you know. There ARE products out there. Ask. Everywhere I go, I ask if something is gluten-free, even before I try a tester of it. In cosmetics and skin-care, companies are not required to list all the allergens like they would be with food. It’s a different industry. If you have any other favourites, please let me know! I’m always on the lookout for great information! 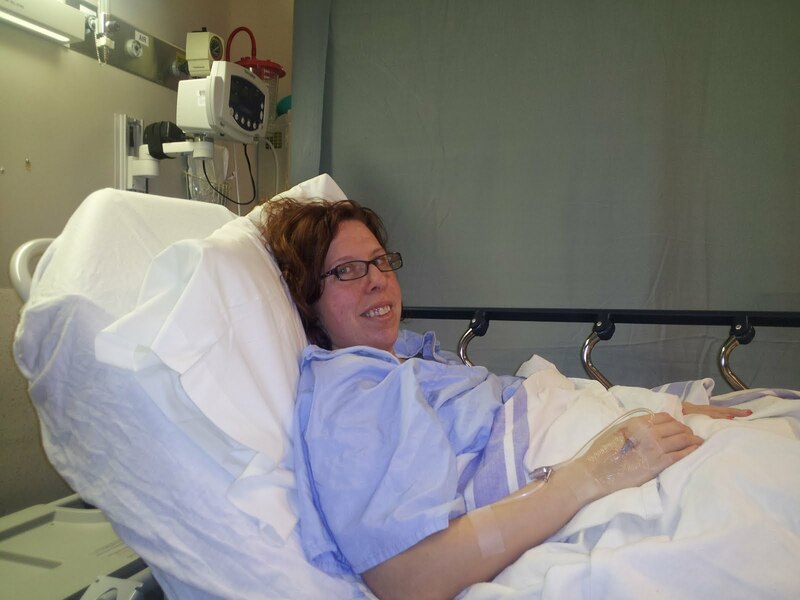 Yesterday, I had an endoscopy as planned. I had been having troubles eating regular foods. I could eat them all, but I couldn’t swallow them properly, or without discomfort. They would go down verrrrryyyyy slooowwwwlllly. Eventually, they’d all get down, but it was uncomfortable. I also found that at times, I’d get heartburn more frequently. So, my (amazing, fantastic, wonderful) gastro doctor decided to scope me. Scopes are pretty standard practice to find: blockages, growths, evidence of esophogeal allergies, evidence of celiac disease, ulcers, etc. It turned out there was a blockage of some sort in my esophogus. They couldn’t see anything in there (and I’m told it looked quite healthy!) but when they put a dialter down, they felt a blockage. They used a small balloon to stretch it and that should solve the problems. I thought I’d use my experience to describe what happens for those of you about to go through it! First I got changed into a beautifully becoming hospital gown that was just the perfect shade of blue for my eyes.. I had had to fast from the previous night on. Would you want to go down someone’s throat with food in there? YUCK! Anyway, then an IV was inserted and some hydrating solution was dripping into my blood stream. It was actually kind of nice because I hadn’t been allowed any liquids and by this point, I was parched! 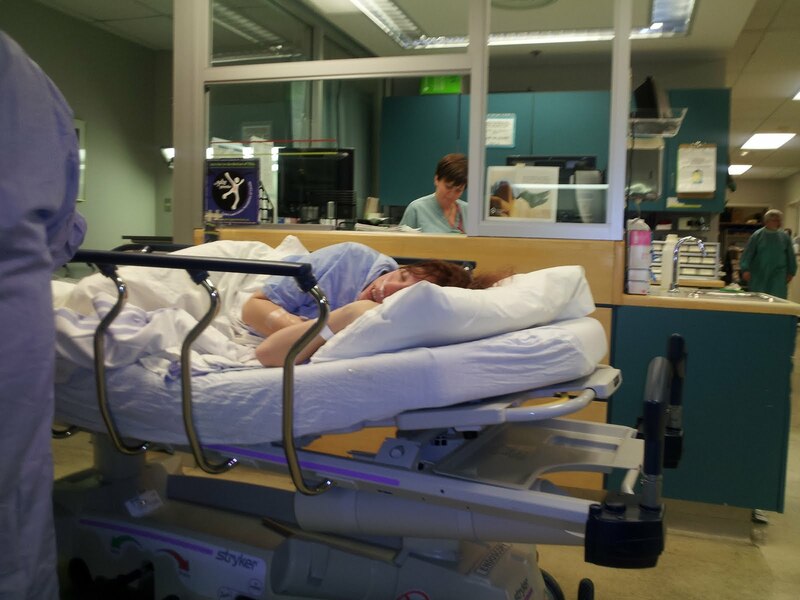 I was wheeled into the room and placed onto my left side. There was my GI doc and 2 nurses. One nurse was at my head the whole time. They inserted a sedative into my IV, put a tooth block into my mouth that I had to bite on and then it was off to la-la land. The sedative feels very icy-burny going up the arm. I remember nothing from that moment until I was woken back up. The GI talked to me for a few minutes about what they did and then I was wheeled out, completely out of it. When you come out of the scope, your throat hurts (kind of like strep throat hurt), and your tummy is huge from the air they pump in to expand everything. You need to be passing gas before you are allowed to leave to make sure you can get all the air out. Under normal conditions, you stay monitored for 30 minutes. If there is anything abnormal – any pain for instance, you usually stay an hour. And then you go home. But, because of the sedatives, you are considered impaired for 24 hours – no driving, no big decisions about money, and generally no work unless you can work somewhere where it can be laid back. You’re pretty tired for a day or so. Then, you need to be careful about what you eat. Soft foods are best because it is tender. 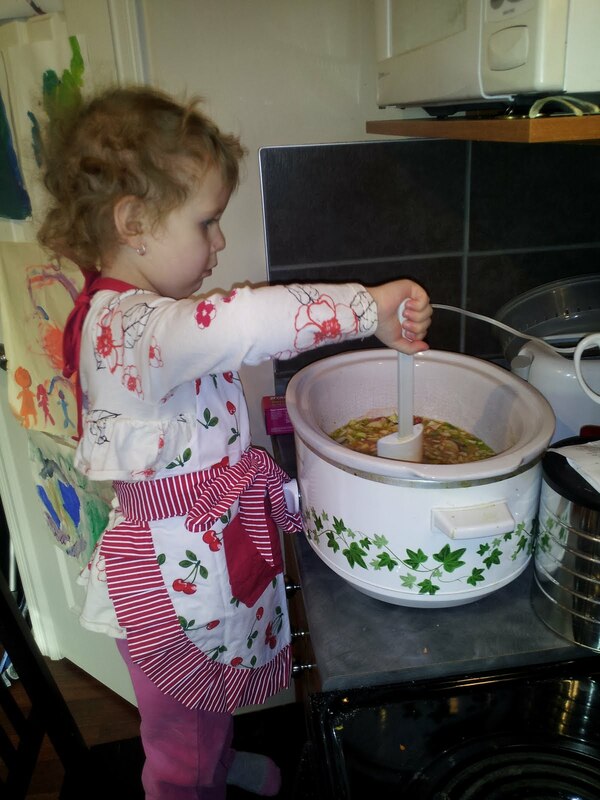 Miss A helped me make some delicious smelling soup for supper. I hope it tastes as good as it smells! And I turned it on high on my slow cooker for 4-5 hours. I’ll puree it all when it’s done. And then I’ll eat it with some buiscuits from Jules’ book Free For All Cooking . There are foods that will help you feel better.. you just have to find them and remember that nutrients help the body heal!! Next Week – Can we Just Skip it? I’m not going to lie – I kind of want to skip next week altogether. You see, almost exactly 3 years after my first, I’m going for a second scope. I’ve been having issues with my esophogus to the point that it feels like there’s something constantly, well, there. As though there’s a big hunk of food constantly stuck towards the lower part. It’s not overly comfortable and it’s quite frustrating. It gives me heartburn frequently and makes food go down really slowly. Some foods make it worse (like overly spicy foods for instance), and nothing makes it better. So after seeing my specialist for the first time in a long time, I’m having a scope (endoscopy) on Monday. Now, the cool thing about scopes is that they get to see inside you and see pretty quickly what’s going on. My doc is unsure as to whether or not it’s related to celiac disease, or whether it’s a different issue completely. Either way, I’m quite relieved to know that I won’t have to wait much past Monday at 1pm to find out. Tuesday should be a walk in a relatively calm park other than the slightly sore throat I’ll have after the scope. Wednesday Miss A goes in for surgery. Three years ago my little monster man had the same surgery – tonsils, adenoids out; tubes in. It wasn’t too horrible and we’ve definitely benefited from that surgery. Three years ago Miss A also had surgery (and for added bonus, so did I.. 3 surgeries in 3 months) to put tubes in her ears. She was ear infection free for a long time after that, but they’ve returned while her hearing has gone to the dogs. Both my kids suffer(ed) from sleep apnea, a potentially serious condition in which people hold their breath. Mr Man was a serious case – labelled moderate to severe as he stopped breathing (and his oxygen levels dropped to the 60s instead of the high 90s where they should be) 16 times an hour. Surgery has fixed that. Miss A is more mild, but still has it – she stops breathing in random clusters. She’ll be fine for a while, and then she’ll hold her breath for periods of time all in a row.. then she’ll be fine again. It’s considered an “urgent case” so she goes under on Wednesday. The idea is that when the tonsils and adenoids are removed, it makes it easier for children to breath consistently. Gone will be her snoring, which truthfully I won’t miss; and she should no longer suffer from apnea. Then we’ll be on a 2 week hiatus from the world. No playdates, no dance, no school. But oh, there will still be fun. There are crafts, and movies, and books, and snuggle time. And there’s the fact that her breath will smell like a combination of dead people and dog breath.. that part won’t be so fun. Anyway, for all of you out there in the blog world, prayers and good thoughts shot my way will be more than appreciated. And hey.. at least after next week, we can start looking at the positives!